Technology | Academics | Policy - Do Patents Stifle Cumulative Innovation? Do Patents Stifle Cumulative Innovation? There has been a movement that began with the notion of the anti-commons that suggested that, whatever the other benefits and faults might be with the patent system, a fault that really matters for the operation of the system and for growth prospects (a la endogenous growth theory) is how patents might stifle cumulative or follow-on innovation. While this appears in the IT and software spaces with work building on other work, the canonical case was in biotech. Specifically, a few years ago the US Supreme Court heard the Myriad case where a patent holder, Myriad, on the genes shown to indicate propensity for breast cancer, exercised their rights with respect to applications that built on that knowledge — most notably, testing for the gene. The Supreme Court decided against Myriad and opted to restrict patent rights so as to promote cumulative innovation. The standard, informal theory of harm here is that follow-on innovators, feeling that they can’t easily deal with the patent holder on the pioneer innovation, decide that the risks are too high to invest and so opt not to do so. To be sure, this ‘hold-up’ concern is not good for anyone, including possibly the patent rights holder who loses the opportunity to earn licensing fees from applications of their knowledge. Suffice it to say, this has been a big feature of the movement against the current strength and, indeed, existence of the patent system. One issue, however, was that the evidence on the impact of patents on cumulative innovation was weak. Mostly that was due to the problem of finding an environment where impact could be measured. How do you measure an innovation, measure follow-on innovations or applications or, indeed, the quality of all of this? Then you have to find a situation where there was a patent experiment to allow you to examine causality. It is a tall order. 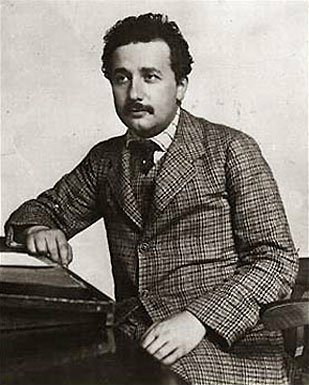 For this reason, all previous attempts concerned intermediate steps — most notably, the impact of patents on citations whether in publications or in patents. This includes work by Fiona Murray and Scott Stern, Heidi Williams and Alberto Galasso and Mark Schankerman. While there is some variation, this work showed, using various clever approaches, that patent protection (or other IP changes) might deter cumulative innovation upwards of 30%. That’s a big effect and a big concern even if the results were somewhat intermediate. At the NBER Summer Institute a new paper by Bhaven Sampat and Heidi Williams (the same Williams from the previous paper) actually found a way to examine the impact of patents on follow-on innovations themselves. Their setting was to look at precisely the area of the Myriad case. They utilised the human genome and the fact that genes that were sequenced could be patented. What’s great about this setting is that the gene itself has a unique identifier that the researchers can use to identify whether it is subject to a patent claim (and indeed a patent application that may be accepted or rejected by the USPTO) and then also identify whether that gene was the subject of publications and clinical trials. This is as good as it gets for the measurement of innovation. But how do you find a way of comparing what happens if there is a patent on a gene sequence versus if there is no patent? After all, there may be no patent because no one thinks that gene is important which may also be the reason why there is no follow-on research. That means you have to find some relatively independent reason why a patent may exist or not. Sampat and Williams exploit imperfections at the USPTO that can be themselves identified to obtain that reason. Do you think he would be a lenient or tough examiner? (For instance, as my co-author, Scott Stern, frequently asks, what would be non-obvious to him?). As it turns out, examiners are identified and it is possible to look at their history and work out if they are tough or lenient. The researchers worked out that this characterisation was unrelated to other things and so could use it to identify patents that might have otherwise been accepted but were given to a tough examiner and the reverse. That is not perfect but is a fairly convincing way to measure and incorporate randomness to assess causality. Prior to this paper, had you asked the 200 economists in the room at the NBER what they thought the outcome would have been, it is fair to say, all of them (including myself) would have predicted that patents would have a negative impact of at least 10 percent. This probably included the authors. As it turned out, the paper showed that those magnitudes in reduction could be rejected statistically. But more to the point, the paper presents pretty convincing evidence that you cannot reject zero as the likely prediction. 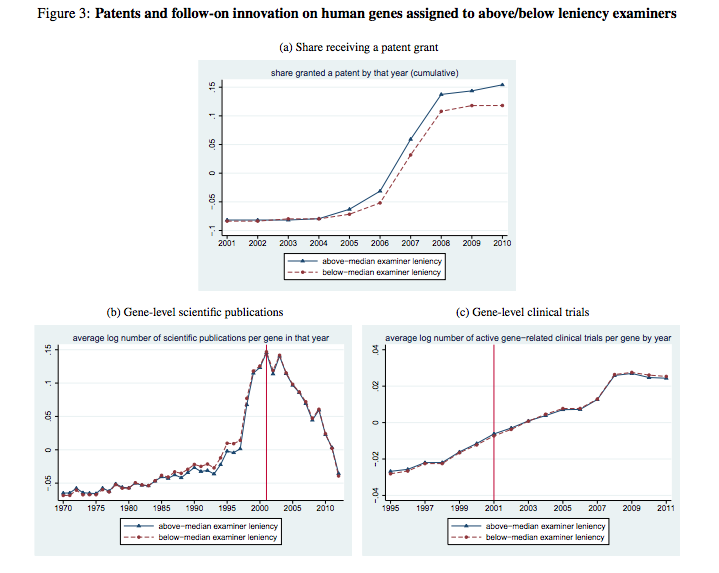 That is, the effect patents on follow-on research appears to be non-existent. Here is the result in graphs. Suffice it to say, while it is only a particular area, this is evidence enough that should cause many to identify and change their bias regarding the impact of patents on cumulative innovation. But more to the point, if we actually look at the economic theory literature on cumulative innovation and patenting, especially the work of Suzanne Scotchmer, we would find that literature predicts that patent rights holders over pioneer innovations will find a way to ensure that follow-on innovators do their innovations and get paid enough to make it worthwhile. The reason is that it is mutually beneficial for that follow-on innovation to occur and in typical Coasian fashion, it works out. To be sure, the follow-on innovators would prefer not to pay the pioneer patent holder but that is secondary to the issue of whether the innovation actually takes place. The Sampat-Williams evidence suggests that for most patent holders, the pioneer innovations do not end up blocking follow-on innovation — at least not because they happen to have a patent. In my mind, this suggests that as a matter of economic modelling, we would do well to abandon as a default our assumption that innovative effort and investment are inherently non-contractible. Somehow, despite formidable measurement issues, there is some way to work out how hard it is (or was) to come up with the follow-on innovation and to take that into account. “Apple took five years to bring this revolution to U.S; Samsung took three months to copy it. That’s the truth and that’s simple, clear, and not disputed.” said McElhinny, referring to the the three months Samsung spent developing the Galaxy S smartphone. Now it is not clear how important that evidence was but its existence is important. If, in patent disputes, relative effort is taken into account, the hold-up problems can possibly be mitigated and, if that is the case, we can expect outcomes to be more Coasian in nature and patents not to block relatively efficient outcomes. This new paper certainly gives us food for thought. The preceding is republished on TAP with permission by its author, Joshua Gans, Chair of Technical Innovation and Entrepreneurship and Professor of Strategic Management, Rotman School of Management. “Do Patents Stifle Cumulative Innovation?” was originally published July 17, 2014 on Digitopoly.